"The Wakefield & Stoneham Street Railway Company was established in 1889, and received a charter three years later. The first tracks ran from Wakefield center to Stoneham, connecting Wakefield with the Lynn & Boston road to Melrose and Woburn. In the fall of 1893, tracks were laid from Wakefield Town Hall via Water Street through Saugus to the Lynn city line, establishing a direct connection with the city of Lynn. In 1894, after much opposition, the company extended its lines to Reading via Main and Lowell Streets. 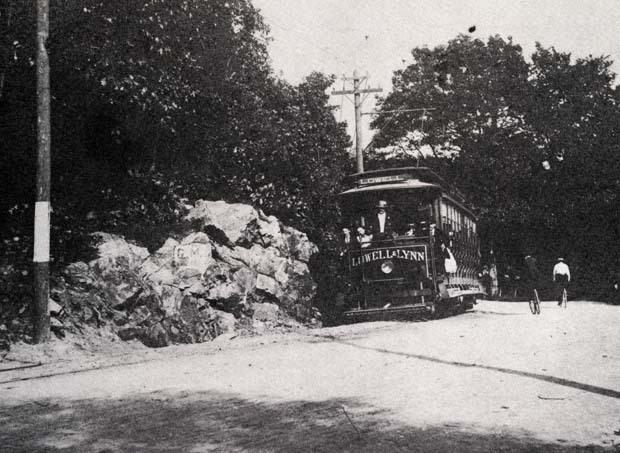 In 1895, an electric line from Reading to Billerica was made with a connection to the Lowell electric street car system. The completion of this road provided a direct electric line between Lynn and Lowell, with Wakefield as an important street railway center for the entire system." -- Text from calendar by Jayne M. D'Onofrio. Photo courtesy of the Cecilia Payro. “Electric car coming from Lynn, Water Street near Brook Street, late 1890's,” NOBLE Digital Heritage, accessed April 20, 2019, https://digitalheritage.noblenet.org/noble/items/show/6929.